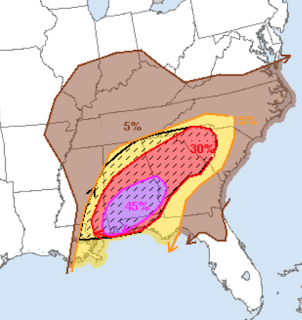 There is another significant risk of tornadoes, perhaps strong in the hatched area, along with very large hail and widespread damaging thunderstorm winds on Monday. Please plan on monitoring local sources of weather information in the yellow, red and purple areas. Note: This includes the Atlanta airport. If you have plans to change planes in ATL tomorrow, you may want to get on the phone to your airline and see if it is possible to route yourself through another hub. If you cannot, see if you can get the earliest possible flight. In a situation like this, earlier is better.